I picked up this poor girl at a local vet's today, someone abandoned her at their sister clinic, and this vet had some exotic experience. They said they thought she had been a classroom pet. 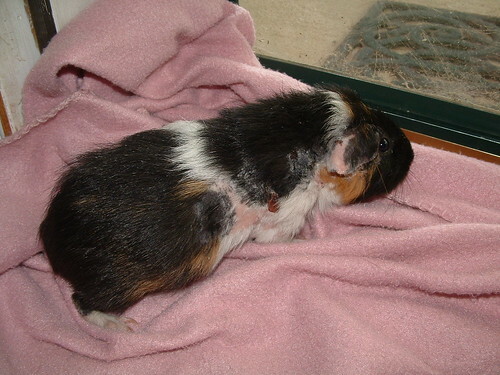 This poor baby is bald on her stomach, both sides, and has huge wounds. She's been on Bactrim for a week and a half at the kind vet's office, and none appear to be abscessing. I'm going to treat with Revolution and go out to snag some Nizoral shampoo in case she's got a fungal problem going on as well. Any other ideas? Anything I can put on her poor skin to give her more comfort? Sorry I don't have any advice but that poor piggy! She is going to be pretty when she's all healed up. If it were my pig, I'd definitely assume that she's got fungal all over. You've probably got two or three things all going on together -- the scratching sets up wounds for secondary infections, etc. I'd probably start her on Vitamin C tablets too -- just to boost her overall nutrition and ability to heal and regrow fur. Keep her on fleece/towels too so that she's on something soft. I've read here of people using cold pressed virgin Coconut Oil as a conditioner and as an emollient. That's about the only thing I'd put on the bald spots. You''l probably want to read the whole thread, but it looked sorta similar to Clementine. Clementine might be happier in a smaller cage. All of my fosters were scared of a big C&C. I hope you can sort out her skin issues soon. Poor girl. Poor Clementine. 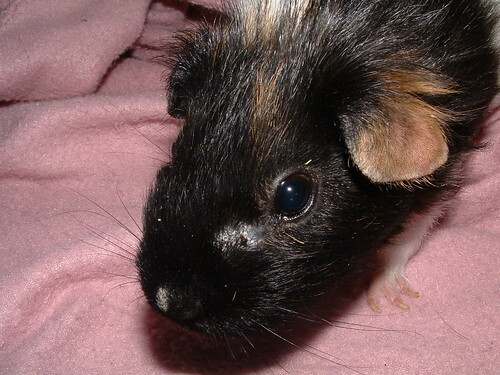 Jennicat, would you mind if I linked people surrendering their guinea pigs and suggesting they'd be good as classroom pets to this thread? This poor, poor girl. What a pretty girl. I can't wait to see her healthy and all loved up like she should be. What have the children learned about seeing a classroom pet get like that? I wonder how she got to the vet. Did a parent kidnap her and drop her off? So sad. That poor little pig! I am glad she's getting some help. I bet she'll be a sweetheart. First of all, thanks everybody for all the great ideas. Feylin -- definitely... I'm actually keeping her in one of the smaller pet store cages just so I can monitor her more closely and pick her up more easily. She is the biggest sweetheart in the world, and will sit sweetly in my lap and let me rub the furry parts of her head. And then she'll give this sort of sigh and put her head down. Very calm considering how she must feel. Jennicat, bless you and thank you for helping her. We just had a very hellish hour. I bathed her with the Nizoral and then she started scratching and seizuring wildly for about 30 minutes. We mutilated a sock to go on her temporarily (which she got out of fairly quickly) and gave her a dose of Metacam. Poor, poor girl. I've never seen a pig seizure so badly with mites. Will do Jennicat. If any millionaires contact me, I will even point them in Clementine's direction (after a slight detour at my bank account). How long ago did she last receive ivermectin? Methinks she needs the Revolution as soon as she can have it. Initially, I thought she'd gotten 4 doses during the 2 weeks she was at the vet, but the vet's letter was a little hard to read. It seems like she's had 4 doses of ivermectin over the past month (whoever surrendered her was having the shots done), but then dumped her there, and they continued ivermectin treatments. As soon as she dries, I'm dosing her with Revolution. I think I'll hit up the vet tomorrow for Program. The metacam really seems to help a ton, she's still itching, but not seizuring, and is making serious inroads on a pile of hay. If she begins to seize again, you could ask the vet for some veterinary Valium (whatever it's called), or possibly some butorphanol. If Metacam does the job, though, hopefully that will be all she'll need. Itching like crazy is awful to watch, but as long as she's not seizing and she is eating, I'd be inclined to continue Metacam but stop there unless she begins to seize again. I've had mixed luck with Benedryl cream, and more so with hydrocortisone cream, at least 1%, Jennicat. It's better to sort of "pat" it on, rather than rub. Rubbing can trigger seizures and/or hours of more itchiness, IME. Also, when you do get ready to bathe again--and I'd hold off, too, ditto on that--I had a lot of luck with EpiSoothe Shampoo and Conditioner. I really, really, slathered on that conditioner and let it sit. Helped a lot with regrowth of nice soft hair, plus soothing the upset skin. I just revolution'd her, and it set off another round of seizures. I ran out and bought bandaging to burrito her, and (of course) I get back and she's stopped. I'm hoping this is a sign that we're winning the mite war. Oh my, poor thing! Thank goodness you rescued her! She has unique markings, when her fur grows back she'll be even more darling. Sending good thoughts for pretty Clementine. She is so lucky to be in your home, now. I hope she has a restful night and a speedy recovery.